New Freebie Challenge for February! Happy February everyone! I’ve had a busy January xD I was actually working on more books! And hopefully some that you’ll get to see very soon. Luckily things have slowed down a bit and I’m able to brainstorm for more stash-busting projects – maybe even get back into making some more hats or plushies! We’ll see how things pan out this month. This one is a cross between a red velvet cupcake, and a red fox kit (kit being a baby fox of course ^-~). Being February with Valentine’s Day coming up, a lovely red cupcake just seemed fitting. It’s sized like a nice big over-sized cupcake, has scalloped frosting edging, perky little ears, and of course a sweet foxy face 😀 You could of course leave off the face and ears and have a darn good cupcake pattern of your own as well. So how do you get this pattern? If you haven’t already, start off by signing up for email updates (found in the submission box on the right sidebar above “My Books”). If you have trouble signing up, you can check out more info at the main Monthly Crafting Challenge page, the FAQ, or by emailing me. So what if you’re already signed up for email alerts? That’s where the challenge comes in. You can get this pattern if you make one of the projects from this blog, my books, or my Etsy then email me or message the finished project to my Facebook where I have a really awesome collection going of your creations! Keep sending me photos every month and you’ll get a new free pattern. Also, bonus! for today only I’m offering both this pattern and the one from January when you sign up. After today though, the prize is just this guy 🙂 You’ll have to purchase the older pattern through my Etsy if you’re too late. So don’t forget to check back next month for a new punny food animal plush pattern, and keep sending me photos of your amazing creations! 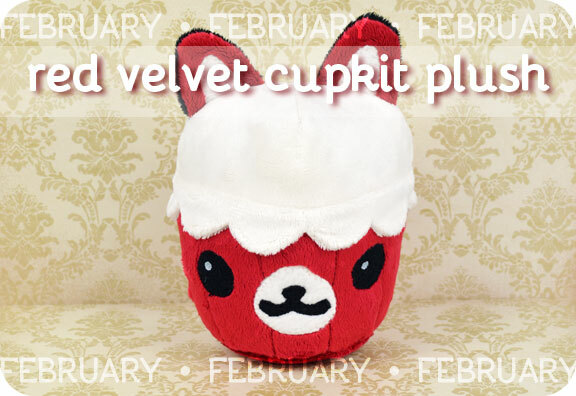 Categories: 2015 Collection, Monthly Crafting Challenge | Tags: animal, cake, challenge, cheese, craft, cream, cupcake, cute, dessert, fox, free, gift, kawaii, kit, pastry, pattern, plush, red, sewing, soft, stuffed, sweet, update, velvet, vulpine | Permalink.